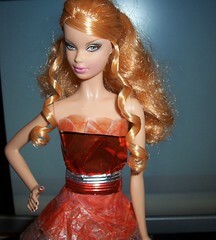 In the first Project Runway challenge, the designers had to take their materials from a grocery store and use innovation and creativity in their designs. The Runway Monday designers timothyjlambert, markgharris, and I were allowed to use anything in our homes that came from a grocery store. 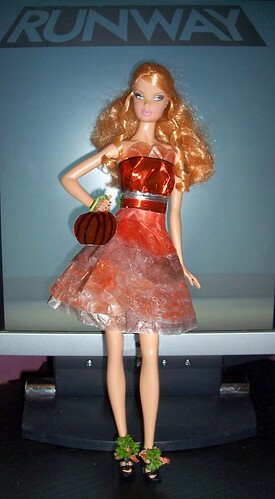 My theme for my model, Summer, was Autumn: Less Goth, More Glamor, and the materials I used were wax paper, orange and brown markers, a chips bag, and parsley. Everyone is encouraged to comment with snark or praise--your choice--and I will respond to all comments. The judges will make their decision on marikanola's journal sometime Monday. Thanks! Design Defense: I wanted to create a party dress that would allow Summer to dance while preventing immodest photos from being splashed across the Internet. Wax paper makes a great fabric for the tiered crinoline design of the skirt, because it holds its shape, has enough weight to stay down even when she twirls, but it doesn't constrict her. Not only can she sit in it comfortably, but the more it wrinkles, the more interesting it gets. 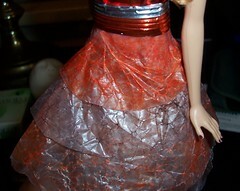 I crinkled it before coloring it so the ink would collect in the lines, giving the fabric texture and definition. I used cut-outs of the wax paper at the top of the bodice. The rest of the bodice and the belt were made from metallic pieces of a (product placement alert!) Munchos bag. 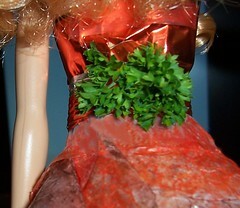 To add drama and interest in the back, I used parsley on the belt. 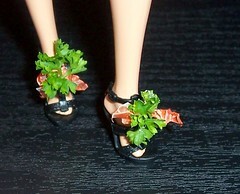 Wax paper ribbons and parsley dressed up her black shoes. 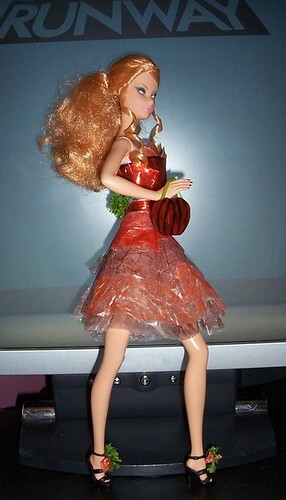 Her purse was also made from the Munchos bag, with a parsley stem strap. Fun, flirty, and feminine--just like Summer! P.S. Summer says to Figarude: Back atcha, babe! As for Nikki, there's no proof (crossing fingers) that her designer was locked in a cage to keep him out of the workroom.